UPDATED: The leader of Norway’s Labour Party said on Monday that both he and his predecessors, who include the current NATO Secretary General Jens Stoltenberg, could have done more to combat sexual harassment within the party. He admitted that no one checked out rumours that flew for years around the party’s now-disgraced deputy leader Trond Giske. “I need to perhaps question myself, and former leaders perhaps should have, too,” Støre told reporters at at a press conference following Giske’s resignation Sunday night. He said he probably just hadn’t wanted to pry into “others’ private lives,” even though Giske’s conduct as a minister was a public issue indeed. 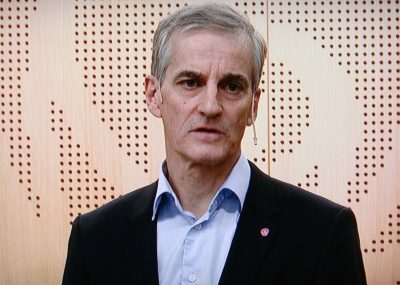 Støre had already announced, following the second emergency meeting of the Labour Party’s national board in just the past week, that he’d lost confidence in Giske as deputy party leader himself. He was glad Giske, who is off on sick leave because of the pressure he’s been under, had announced himself that he would not be returning to his deputy leader position. Giske, who as deputy leader was considered a prime minister candidate for Labour, also offered to resign as the party’s finance policy leader and spokesman, and that’s been accepted. Giske will, however, and is obligated to return as an elected Member of Parliament, and Støre said Labour’s parliamentary delegation would support him. Støre stressed that after evaluating the contents of several complaints of sexual harassment filed against Giske, he believed the women’s stories about Giske’s “inappropriate behaviour” towards them. Støre said the party had been gathering information about the alleged incidents and found that documentation supports the whistleblowers’ stories. “I believe that what we now know is enough to say that he (Giske) has behaved in a way that is not in line with our regulations and our values,” Støre said. The Labour Party is built, he said, on principles of equality and mutual respect in the workplace, and it has fought for years against abuse of power. Støre said he was especially alarmed over the differences in power and age between Giske and the young women filing complaints against him. Giske declined comment on Støre’s statements at the press conference. He remains a Member of Parliament for Labour, but will also give up the post he battled to get last fall as finance policy chief. Støre said the party was already evaluating his replacement. NRK contacted Stoltenberg’s office at NATO in Brussels to seek comment on what many interpreted as criticism of Stoltenberg’s tenure as prime minister, and Giske’s former boss. The criticism follows much harsher reaction from several women who have claimed that none of Labour’s leaders over the the years have done their jobs regarding harassment at work, and thus quietly seemed to condone it. 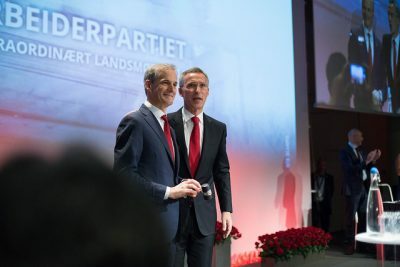 Several of the alleged incidents of Giske’s harassment took place when he was both minister of culture and of business trade during Stoltenberg’s Labour-led governments that held power form 2005 to 2013. Stoltenberg became head of NATO in 2014. “Secretary General Stoltenberg doesn’t get involved in cases that concern Norwegian politics,” responded Stoltenberg’s special adviser in strategic communication, Stein Hernes, to NRK’s request for comment. Hernes also wrote in a text message to NRK that any cases involving whistleblowers would have been handled by the party’s secretary as top administrator. Stoltenberg, when confronted with Støre’s comments, thus seemed to pass the buck to the party secretaries who were in charge of administration during his governments. They included Raymond Johansen, from 2009 to 2015, and Martin Kolberg from 2001 to 2009. Johansen, who now serves as head of Oslo’s city government, declined immediate comment while Kolberg, now a Member of Parliament, said on NRK’s national morning radio program Politisk kvarter Tuesday morning that no specific harassment complaints were filed during his tenure. Giske has apologized for behaviour he claims he didn’t realize was offensive. He has also, however, claimed that not all the reports of his alleged harassment are correct. He has denied several of the claims against him regarding incidents from several years ago. He will still have a chance to give his version of events and Støre said Labour colleagues will welcome Giske back when he eventually returns to Parliament following his sick leave, adding that everyone who’s admitted to mistakes can and should be offered a new chance. Støre said he found it unlikely, though, that Giske would ever be able to return to top positions within the party.